Our primary interests pertain to the molecular mechanisms that underlie the virulence of the respiratory fungal pathogen Histoplasma capsulatum, thecausative agent of histoplasmosis. In particular, our studies focus on the interaction betweenHistoplasma yeasts and their primary host cell, the mammalian macrophage. Unlike opportunistic pathogens, Histoplasma can cause disease even in immunocompetent hosts, indicating that Histoplasma has specific mechanisms designed to promote its pathogenesis. Our research has uncovered two of these mechanisms: masking of immunostimulatory cell wall molecules and production of extracellular defenses. Beta-glucan-containing fungal cell walls are potent activators of signaling receptors on the surface of macrophages. However, Histoplasma elaborates an alpha-linked glucan which masks beta-glucan polysaccharides from detection. We have also discovered a secreted endoglucanase which further removes any exposed beta-glucans on the cell wall, further enabling Histoplasma to be taken up by macrophages without alerting the macrophage. Phagocytosis by immune cells exposes fungi to antimicrobial reactive oxygen produced by phagocytes. 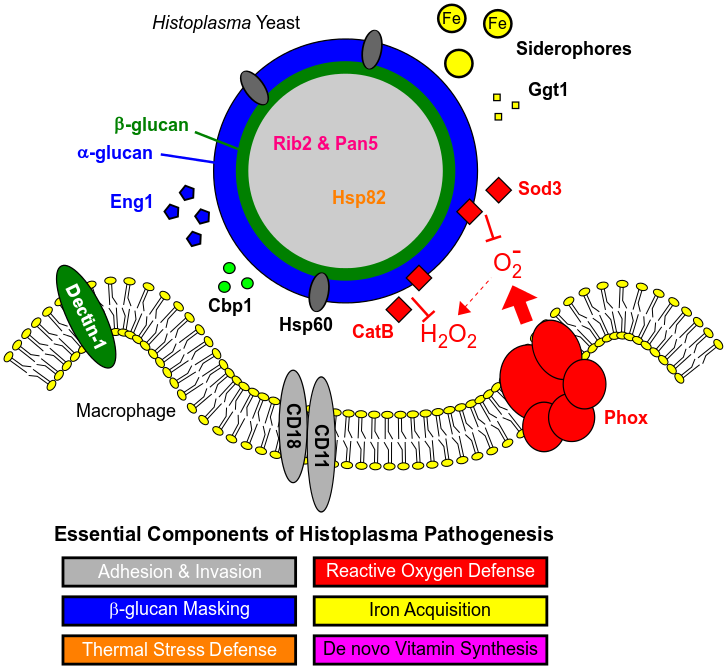 Histoplasma yeast secrete a superoxide dismutase as well as a catalase which effectively destroy these phagocyte defense molecules, thereby enabling Histoplasma yeast to survive during infection. To discover additional factors contributing to the pathogenesis of Histoplasma, our lab uses genomics-based analyses (transcriptomics and proteomics) as well as forward genetic screens. As candidate virulence genes are identified, their importance is assessed through the creation of loss-of-function strains. For this purpose we have developed and optimized molecular genetic techniques for Histoplasma including RNA inteference for gene product depletion as well as insertional mutagenesis using Agrobacterium tumefaciens T-DNA. Histoplasma is a natural pathogen of mammals and thus, virulence can be quantified with excellent animal models of respiratory and disseminated disease as well as in vitro culture systems which facilitate studies to dissect the effect of fungal proteins at the cellular level. To provide a more complete description of the molecular basis of fungal pathogenesis, our research also investigates the host side of the host-pathogen equation. Using retroviral and lentiviral RNA interference systems to reduce host gene functions, we can now test the involvement of host molecules in the response to Histoplasma infection. This ability to perform loss-of-function experiments in both the host and pathogen combine into a powerful system to define fungal virulence factors and the cognate host pathways targeted. Our interests also extend to clinical application of fungal pathogen research, namely the development of improved fungal diagnostics and antifungal therapeutics. 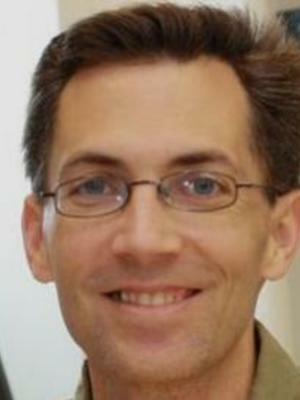 Our lab is part of a group of researchers at Ohio State pursuing antimicrobial drug discovery. We are screening multiple small molecule libraries and have discovered compounds that significantly inhibit fungal growth. One such compound has sub-micromolar in vitro efficacy against Histoplasma and Cryptococcus, two fungal pathogens that cause disease in otherwise healthy hosts and which are naturally resistant to the echinocandin-class antifungal drugs. In addition, we are applying our expertise in proteomics to discover new biomarkers that could provide specific and early indications of Histoplasma and Aspergillus infections. With improved diagnostics and antifungal options, we hope to reduce the morbidity and mortality resulting from systemic fungal infections. Goughenour KD, Balada-Llasat JM & Rappleye CA. (2015) Quantitative Microplate-Based Growth Assay for Determination of Antifungal Susceptibility of Histoplasma capsulatum Yeasts. J Clin Microbiol. 53(10):3286-95. PMID: 26246483. Holbrook ED, Kemski MM, Richer SM, Wheat LJ, Rappleye CA. (2014) Glycosylation and immunoreactivity of the Histoplasma capsulatum Cfp4 yeast-phase exoantigen. Infect Immun. 82(10):4414-25. PubMed PMID: 25114108. Garfoot AL, Zemska O, Rappleye CA. (2014) Histoplasma capsulatum depends on de novo vitamin biosynthesis for intraphagosomal proliferation. Infect Immun. 82(1):393-404. PMID: 24191299; PMCID: PMC3911860. Edwards JA, Chen C, Kemski MM, Hu J, Mitchell TK, Rappleye CA. (2013) Histoplasma yeast and mycelial transcriptomes reveal pathogenic-phase and lineage-specific gene expression profiles. BMC Genomics. 14(1):695. Holbrook ED, Smolnycki KA, Youseff BH, Rappleye CA. (2013) Redundant Catalases Detoxify Phagocyte Reactive Oxygen and Facilitate Histoplasma capsulatum Pathogenesis. Infect Immun. 81(7):2334-46. Kemski MM, Stevens B, Rappleye CA. (2013) Spectrum of T-DNA integrations for insertional mutagenesis of Histoplasma capsulatum. Fungal Biol. 117(1):41-51. Yousef BH, Holbrook ED, Smolnycki KA, Rappleye CA. (2012) Extracellular Superoxide Dismutase Protects Histoplasma Yeast Cells From Host-derived Oxidative Stress. PLoS Pathogogens 8(5):e1002713. Zemska O, Rappleye CA. (2012) Agrobacterium-mediated Insertional Mutagenesis in Histoplasma capsulatum. Methods Mol Biol. 845: 51-66. Youseff BH, Rappleye CA. (2012) RNAi-based Gene Silencing Using a GFP Sentinel System in Histoplasma capsulatum. Methods Mol Biol. 845:151-64. Edwards JA, Rappleye CA. (2011) Histoplasma Mechanisms of Pathogenesis--One Portfolio Doesn't Fit All. FEMS Microbiol Lett. 324(1):1-9. Edwards JA, Zemska O, Rappleye CA. (2011) Discovery of a Role for Hsp82 in Histoplasma Virulence Through a Quantitative Screen for Macrophage Lethality. Infect Immun. 79(8):3348-57. Holbrook ED, Edwards JA, Youseff BH, Rappleye CA. (2011) Definition of the Extracellular Proteome of Pathogenic-phase Histoplasma capsulatum. J Proteome Res. 10(4): 1929-43. Edwards JA, Alore EA, & Rappleye CA. (2011) The Yeast-Phase Virulence Requirement for alpha-Glucan Synthase Differs among Histoplasma capsulatum Chemotypes. Eukaryotic Cell 10(1):87-97. Rappleye CA. (2010) Histoplasma capsulatum. In: Borkovich KA, Ebbole DJ, editors. Cellular and Molecular Biology of Filamentous Fungi. Washington DC: ASM Press; 2010. p. 736-50. Youseff BH, Dougherty JA & Rappleye CA. (2009) Reverse genetics through random mutagenesis inHistoplasma capsulatum. BMC Microbiol. 9, 236. Rappleye CA, Goldman WE. (2008) Fungal stealth technology. Trends Immunol. 29, 18-24. Holbrook ED & Rappleye CA. (2008) Histoplasma capsulatum pathogenesis: making a lifestyle switch. Curr Opin Microbiol. 11, 318-324. Rappleye CA, Eissenberg LG & Goldman WE. (2007) Histoplasma capsulatum alpha-(1,3)-glucan blocks innate immune recognition by the beta-glucan receptor. Proc Natl Acad Sci U S A. 104, 1366-70. Almeida AJ, Carmona JA, Cunha C, Carvalho A, Rappleye CA, Goldman WE, et al. (2007) Towards a molecular genetic system for the pathogenic fungusParacoccidioides brasiliensis. Fungal Genet Biol. 44, 1387-98. Krajaejun T, Gauthier GM, Rappleye CA, Sullivan TD & Klein BS. (2007) Development and application of a green fluorescent protein sentinel system for identification of RNA interference inBlastomyces dermatitidis illuminates the role of septin in morphogenesis and sporulation. Eukaryot Cell. 6, 1299-309. Marion CL, Rappleye CA, Engle JT & Goldman WE. (2006) An alpha-(1,4)-amylase is essential for alpha-(1,3)-glucan production and virulence inHistoplasma capsulatum. Mol Microbiol. 62, 970-83. Rappleye CA & Goldman WE. (2006). Defining virulence genes in the dimorphic fungi. Annu Rev Microbiol. 60, 281-303. Rappleye CA, Engle JT & Goldman WE. (2004) RNA interference inHistoplasma capsulatum demonstrates a role for alpha-(1,3)-glucan in virulence. Mol Microbiol. 53, 153-65.